Author, Wife, Mother, Leader. Living leadership to change the world, one person at a time. Also visit her at kristinmwoodman.com. I always knew I would be a working mom. Long before I understood what that really meant, or even found someone to share the journey with. Reality has proven to be more wonderful, and challenging, than I ever imagined. Managing both means being present, making progress, and knowing my priorities. It means making trade-offs every day that allow me to be the best I can at both, but falling short of perfection at either. Years into this exciting journey, I sometimes dismay when I hear people talk about how much I seem to get done. The "how does she do it all?" question is easy to answer. I don't. And neither does anyone else. Let's dispel the "do it all" myth and talk about how we can best manage whatever it is that we commit to doing. First off, I'm fundamentally missing the domestic gene. It's no secret. I even wrote it into our vows -- I will love my husband, but housework just isn't happening. Home-related stuff can be a full-time job on top of work. I have no expectation that I can or need to do it all. Talking with a friend recently, she mentioned feeling obligated to do something she didn't sign up for. That is a reminder to all of us -- we cannot do it all, and should not feel burdened by a sense of obligation that pushes us to try. I'm not domestic, and that doesn't make me less of a woman. I'm a good mom, and I'm not perfect. I don't obsess about where I might be falling short, instead I focus on what I want to do well. In order to life a relatively guilt-free life, and feel good about our ability to parent, work, befriend and self-care, that's where we must begin. Before I sign up for anything, I decide whether I want to bother. Most things fall out of this step. A spotless house? Gourmet meals? Not a chance. So what do I prioritize (besides work if we assume that's a given)? Everything else has to compete for my time and energy. Lately, I have not had much of that. Assuming we have our priorities aligned and said "No" to those things that do not fit, now we have to deliver on our commitments. Sometimes this is easier said than done. However, take it from this domestic un-goddess...delivering on our commitments can be accomplished in many different ways. If we're not sure how to get it all done, and still retain a semblance of sanity, it's time to get creative. For those of us that work outside the home, we are used to delegating (and being delegated to). Why should home be any different? If we think about how much time it takes for us to accomplish a task, and the cost of that time, sometimes it's more affordable to outsource. In our home, yard and housework are a simple example. My husband likes a clean home. For me, it's great, but not if I have to do the cleaning. Even having someone come in every other week can recoup many hours better spent on other priorities. Just because something needs to get done, does not mean it needs to be done now. Like our work priorities -- some things are urgent and important, while others are important but not urgent. Evaluate commitments and determine which ones can be deferred until there is time available to get it done. Often, grouping similar activities means saving time. Tackling five or six errands while we're out is more effective than doing one each day of the week. I handle laundry the same way. I have enough clothes to go at least 6 weeks before I have to worry about it. Then I consolidate the time, rather than spreading it out. Technology can be our friend at home as much as work. Having a common calendar for the household, and being able to view both work and home commitments, can ensure appointments, pick up/drop off routines, and after-school activities are not forgotten. Automation can also help extended families keep in touch. My family is all over the country, so we have a private blog that I update via my phone. When we were in the process of adopting, it allowed me to keep everyone informed without having to spend time on endless phone calls and emails. No one said getting it done meant getting it done "Pinterest" style. We need to remember it's the thought that counts, and often a hack can save the day (and our sanity). We are all about planning ahead to save time during hectic periods. We pre-cook many of our meals on the weekend, so we're not scrambling after work. Leftovers may not be fancy, but they're food. Another example is with gifts. I start buying birthday and Christmas presents in January, a little bit at a time. If my son forgets to tell me about a birthday party, I can "shop" in my stash. Once we've made commitments, we need to find those solutions that work for us and for our families. Yet it all falls down if one thing is missing. Compassion. We are a lot of roles to a lot of people. Mom, wife, daughter, friend, employee, manager. Those roles carry expectations, but there's one more role to remember that we all tend to forget. Ourselves. We try to be the best selves we know how to be, even if we aren't perfect. The key isn't forgiving ourselves, but simply not judging. We must accept that we will make the best choices we can, prioritizing the right things along the way. 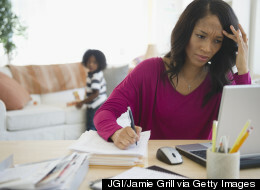 For every working mom that seems to have her stuff together, her reality is much different. However confident she may appear, she has doubts whether she's doing her best for work or family at any given moment. Yet, I suspect she knows her priorities, has a good support system, and can delegate, defer, automate or hack her way through what she needs to. What's important for all of us is to invest our energies into what is most critical, make choices and trade-offs for the rest, and allow for the reality that none of it will be perfect. Embrace imperfection. Because trying to do it all perfectly can only result in one thing. Failure...whether it's our sanity, health, or both. What solutions do you recommend to get time and energy back in your day for what's most important? Please share your thoughts in the comments. Kristin Woodman encourages people to live and lead authentically, affecting positive change for ourselves and those around us.